Irish decal features EIRE which is the Gaelic language word for Ireland. IRL is the international vehicle registration code for Ireland. This Euro style IRL decal is printed on waterproof laminated, durable vinyl stock with UV (ultra-violet) blocking inks. 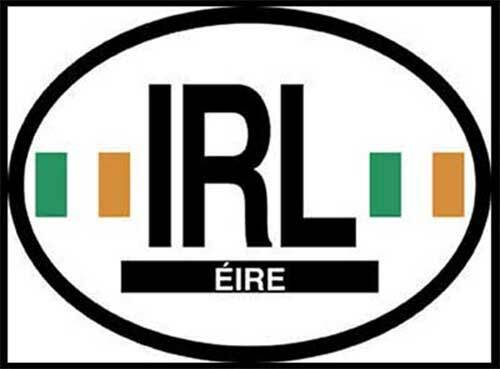 The IRL sticker features the Irish ERIE along with two Irish flagshas non-permanent adhesives for easy removal making them great for cars and travel trailers along with boats and motor homes. The reflective 3 ½” x 4 3/4” oval IRL decal from The Irish Gift House is also suitable for trucks and motorcycles. IRL decalis made in the United States.